Una Mamma Italiana: The Mamma Meets the Cucina: Feast of the Seven Fishes! The Mamma Meets the Cucina: Feast of the Seven Fishes! Christmas Eve's Feast of the Seven Fishes or "La Vigilia" comes from a long standing Catholic tradition of avoiding meat on the vigil of (vigil = the night before) the Feast Day of Christmas. Tilapia is a favorite meatless dish in our house, which is why I chose to highlight it for this blog post. Now, our family might not have ALL seven dishes include fish, but we will throw on some shrimp fra diavolo, even if it is served sans capellini as an appetizer. But the tilapia and the pasta dish are a staple for us on Christmas Eve. It's yummy enough to impress the crowds of friends and family, but easy enough to handle as we quickly end the game of Scopa and rush to Midnight Mass! So give these a try - even if it's not for La Vigilia - they make a great accompaniment to each other. This recipe is one of easy, healthy , and tasty all at the same time. Even kids are huge fans - whaddaya know?! A kid-pleasing fish dish without the word "stick" in the title! Coat the tilapia in the melted butter. Mix all dry ingredients. Season with salt & pepper to taste. Coat the tilapia i the bread crumb mixture. Place on parchment lined baking sheet and bake for 15-20 minutes at 400 degrees. Serve immediately with a side of GEMELLI PASTA!! This dish is so simple, yet full of flavor. The red and green of the tomatoes and the arugula make a great addition to the Christmas tablescape. Add 2-3 tbsps of e.v.o.o. to a large, deep skillet. Saute the garlic until light caramel in color. Add the arugula and cook until slightly wilted. (NOTE: you could use spinach here if you do not like arugula. The idea is to get the green color and an added distinct flavor) Remove and set aside. Add the crushed tomatoes, crushed red pepper, salt & black pepper to taste. Simmer for 20 minutes or so. 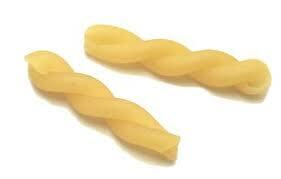 Boil the gemelli till al dente. Just before draining, add the arugula back in. Drain the pasta and toss with the sauce. Serve immediately. My family has been celebrating Christmas Eve with the traditional Feast of the Seven Fishes for as long as I could remember, and of course many years before that. For years, our meal would consist of most of the traditional dishes, such as baccala soup, smelts and shrimp. Non-fish dishes, such as spaghetti aglio e olio (garlic and oil) and chicken cutlets would also be served for those not-so-much into seafood. Over the past few years, my cousins, my brother and sister-in-law, and myself have been stepping up to help relieve our aunts and Grandmother from the heavy kitchen duties, while at the same time trying to update the menu a bit with some more modern dishes such as seared scallops and crab cakes. However we still make sure to keep some of the traditional staples in the rotation. This year I am very proud and honored to be taking over one of the crown jewels of the table, stuffed calamari. Now chances are that many of you are only familiar with the more popular Italian eatery appetizer, fried calamari. Unlike the fried rings, stuffed calamari is actually using the whole calamari tube, stuffed with a breadcrumb and cheese filling, and cooked slowly in a pot of red sauce (I don't use the word gravy here because there is no meat involved). When cooked, they resemble a stuffed shell, and they are tender enough to cut without a knife! If you have never tried stuffed calamari, I encourage you to do so. Whether you serve it along with pasta or on its own, I guarantee you it will make for a special part of your meal, especially if you are planning to celebrate a traditional Italian Christmas Eve. In a large pot, sauté garlic in heated olive oil. Add tomato sauce and sauce seasonings. Add water until desired consistency. Bring to a slow boil, then lower the temperature to simmer. Mix stuffing ingredients, add oil and mix with hands until you get a nice, meatball-like consistency. Using a spoon, loosely stuff each calamari tube. You don't want to pack the tubes, because the stuffing will expand and the calamari will shrink when cooked. Secure the open ends of the tubes with a toothpick. Add the tubes to the sauce, cook on a medium-low simmer for 2 hours. You're looking for a string cheese consistency when you slice into the calamari. Serve and enjoy! – We would like to wish all of our readers a happy and peaceful holiday and the warmest wishes for the New Year. Buon Natale!